At first glance, The Online Casino feels like the most suitable possible name for an online casino, right up until the point that you realise that it’s virtually impossible to Google. That makes the name of this site both predictable and badly thought out, so it will come as no surprise to anyone with knowledge of the online casino industry that The Online Casino is one of the newest sites to come from Nektan, the network characterised by predictable and badly thought out ideas. We have been waiting patiently for Nektan to come out with something different, something interest, just something that doesn’t feel like anything else they’ve ever done, but that has been a wholly unsuccessful exercise thus far, and the casino world is starting to get tired. However, perhaps The Online Casino brings a new, straight to the point approach from Nektan. That isn’t to say this is an operator that particularly went for bells and whistles before, but there was always a sense that players were expected to be impressed by the bold design concepts, however lacklustre they may have been in reality. With The Online Casino, it is possible that Nektan are stepping away from this history, and presenting something that is more games focused and less based on the aspects that Nektan have proven themselves as less than capable of making work over the years. Nektan sites have always been characterised by basic logos and simple design concepts, but in the case of The Online Casino, those factors are used in a way that feels more suitable to the site itself. The simplicity here gives a certain sense of sleek sophistication, with a dark blue and green colour scheme and a background that uses images from popular slots to create a sense of epic in the banner at the top of the homepage. As you scroll down the page you will be met with various thumbnails allowing access to popular games, as well as a search box if you know exactly what it is you’re looking for. The design here is excellent by Nektan’s standards, which isn’t necessarily saying much, but in this case, it’s probably fair to go further. While this is not the best design concept we’ve ever seen by any stretch of the imagination, it is a good looking enough site to create a nice package for the games on offer, and as long as those games can back that up, which is something Nektan is definitely capable of, then this site should be okay. When it comes to offering a strong selection of games, that’s the one aspect that Nektan has rarely struggled with, and there’s no issues here either. 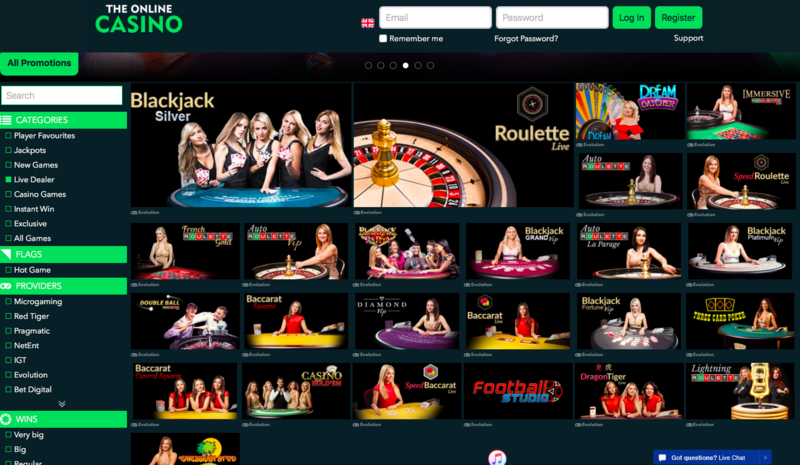 Titles at The Online Casino come from the likes of 1X2 Network, Betdigital, Big Time Gaming, Blueprint Gaming, Core Gaming, edict egaming, ELK Studios, Evolution, Extreme Live Gaming, Eyecon, Felt, Gamevy, IGT, IWG, Microgaming, Nektan, NetEnt, NextGen Gaming, Pragmatic Play, Realistic Games, Red Tiger Gaming, SG Digital, SG Gaming, Spin Games, Williams Interactive, and Yggdrasil, so you will not be short of options. 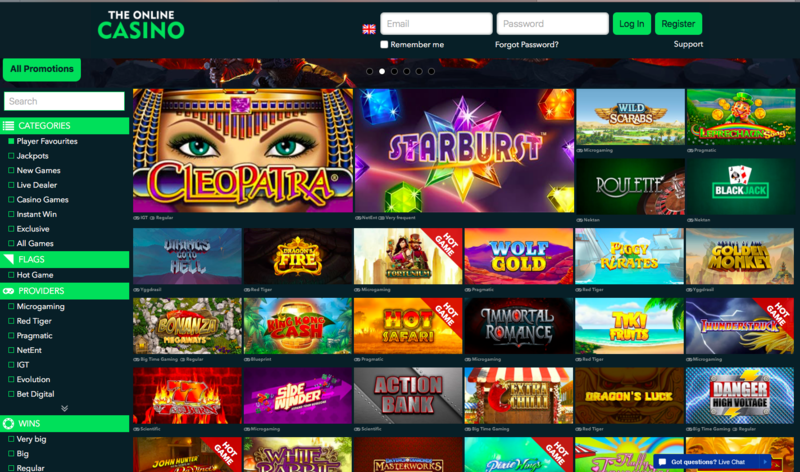 The variety doesn’t only exist with software developers either, there is also a wide range of game types on offer, including a smorgasbord of slots, a cacophony of casino games, and a smattering of scratchcards thrown in for good measure. Whatever it is that you’re looking for in terms of the online casino experience, the chances are you’re going to find it at The Online Casino. This site is a definite step forward for Nektan, and we can hope this is the start of a whole new era for the operator.